Medical equipment like hospital beds and mobility aids can run into the thousands of dollars. Now you don’t have to worry about how you’ll pay for them. Our financing program is fast and easy, with monthly payment options to make things more affordable. We can approve a wide range of credit scores. And more approvals means more ways for you to receive the durable medical equipment you need. We can provide loans from $1,000 to $35,000. That gives you the power to afford more of the services you want, when you want them. We offer no interest on principal if paid in full within the first six months of your disbursement date*, plus affordable monthly payment options that work with your budget. We designed our loan products with you in mind, and have no tolerance for prepayment and interest rate penalties. So we don’t charge any. What makes us better than a credit card? Unlike credit cards, we offer fixed payment amounts with fixed terms. This gives you greater flexibility and control over how you manage your monthly expenses. It also allows you to pay no interest on principal if paid in full within the first six months of your disbursement date*. You can apply online, from anywhere. Simply provide the required information, choose your term and monthly payment, and then sign the online agreement. It’s all fast, easy, and secure. You won’t be penalized for exploring your options, so there’s no reason to delay. That’s because now is always the best time to finance life’s important moments. All loans are made by Cross River Bank, a New Jersey State Chartered Bank. Member FDIC. Loan amounts range from $1,000 to $35,000. No loans are offered in Connecticut, New Hampshire, West Virginia, Vermont, Puerto Rico or any other unincorporated US territory. The APR’s range from 14.99% APR to 29.99% APR. An origination fee of up to 8% may be included in the principal loan amount that results in an APR up to 29.99%. *Your loan has a No Interest on Principal Option Promotion included. This promotion can save you money if you pay off the principal amount of the loan in full within the Promotional Period (“Promotional Period”). During the Promotional Period you will be responsible for making all of your monthly payments and your loan will accrue interest on a monthly basis. If you pay off your loan within the Promotional Period, the monthly payments that you have made during this period, which includes accrued interest, will be deducted from the principal amount of the loan. Length of Promotional Periods vary, please review your loan agreement for full details. † To check the rates you qualify for, LendingUSA does a soft credit pull that will not impact your credit score. However, if you choose to continue your application, your full credit report will be requested from one or more consumer reporting agencies, which is considered a hard credit pull. Copyright © 2019. 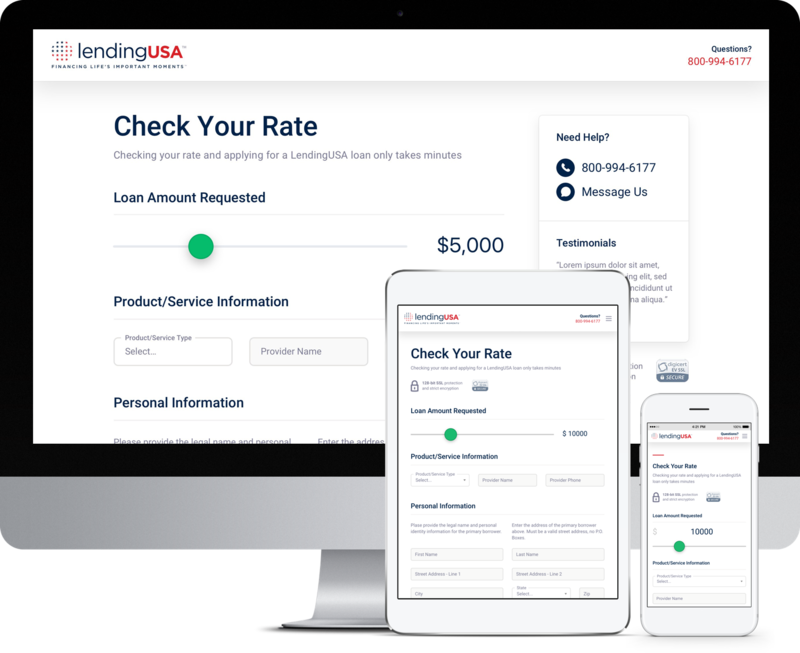 LendingUSA, LLC. All Rights Reserved. Learn how we can help you increase revenue and get paid faster than before. Get the goods and services you want with our easy payment options.